Visit care.theemergencycenter.com/guide to get our FREE guides to common emergencies. Let’s face it. It’s not easy to think clearly when you’re sick or injured. Making decisions when your mind is foggy could lead to costly mistakes for your health. You might delay seeking care thinking you can wait out your misery, or you could visit a care facility that isn’t equipped to give you the treatment you need. At The Emergency Center, we don’t think anyone should self-diagnose. That’s why we created two FREE guides to give you some objective advice about when you need to visit one of The Emergency Center’s locations in Arlington, Fort Worth, or San Antonio or when you could visit an urgent care or wait to see your primary care doctor instead. The “Emergency Care Go-to Handbook” is a comprehensive, 16-page booklet that covers a range of illnesses and injuries—from fever and nausea to head injuries, chest pain, and severe allergic reactions—that helps you determine when these conditions need immediate attention. When you submit your mailing address, we’ll mail you the guide, which also includes a refrigerator magnet on which you can write your emergency contacts. 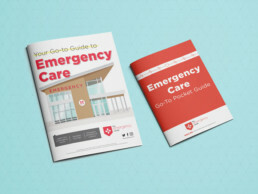 “Your Go-to Guide for Emergency Care,” a downloadable PDF, includes an infographic that helps you understand the differences between The Emergency Center, urgent care clinics, and traditional hospital emergency rooms (ERs). The guide also outlines the most common symptoms that send people to ERs and explains when these problems are serious health threats and when treatment can wait. Finally, print out the last page, which includes a checklist of symptoms that always need emergency care. Know when you or a loved one should go to the ER. Get your free guides today!